We’ve heard of Recruiter Rewards & Recognition and have either seen or experienced its impact first hand. Then again not all of us are fortunate enough to have such experiences but are still required to formulate Recruiter Rewards & Recognition plans and to follow through with the plan. What are the different categories of Recruiter Rewards & Recognition? Another discussion ends with a lot of perspectives and views to think about and you too have added to your knowledge if you’ve read this far. So let’s not keep you waiting and get right to the point by leaving you with our key take away points to bear in mind. Whether you’re formulating your own Recruiter Rewards & Recognitions plan or have had a first – hand experience or even watched a friend receive one, you’ll definitely learn something new. Rewards & Recognitions can be motivational factors but it depends on the setup, whether an agency or a corporate. Irrespective of whether it’s a corporate or an agency set up has a bearing on a Recruiters performance. Rewards & Recognition can be strategically linked to factors like usage of a particular source for recruitment or on the number of positions filled or to even stakeholder management. Such benefits decrease attrition while their performance increases as they are motivated to get it the next time. Money can be earned through various means but recognition is something every employee’s subconscious mind craves for. Daniel Pink proves that more the incentive less the productivity but more R&R will boost morale and thereby productivity will improve. According to Herzberg’s motivation- hygiene theory; one has to separate the hygiene factors like pay, incentives etc. from the non – hygiene factors or motivating factors like challenging work, recognition etc. so that the employee gets satisfied. Instead of concentrating more on incentives; recognition should be given more emphasis to boost morale. Outstanding Performance – It is based on the numbers every month for outstanding performance. Customer Delight – It is based on critical closing, TAT, and BU appreciation. Above and Beyond – It is based on people who go beyond the scope of work defined as in; involvement in organisations initiatives, team building, mentoring, etc. Innovation – It is based on people who go beyond the scope of work defined as in; involvement in organisations initiatives, team building, mentoring, etc. Weekend Warriors – Recruiters conducting weekend drives can be termed Weekend Warriors and rewards on the combined parameters like effective management on drives, candidate experience, effective feedback capture and reporting post drives, panel management etc. Channel Crusader – It is based on people who go beyond the scope of work defined as in; involvement in organisations initiatives, team building, mentoring, etc. Consistent Performer – It is based on the numbers every month for consistent performance. Spot incentives – Over achieving their targets or closing niche skill positions or having early joining if the candidates say in a week’s time; according to Sheetal. R R & R should be based on 360 degree feedback mechanism in addition to the KPIs success according to Adwait. The Dedicated to the Client reward category was very well received and clients were requested to give away the awards. The process was conducted online using life-size cloud platform like Skype and the Team was super energised. Such RR & R would definitely be an extra feather in cap and is obviously a Recruiter’s privilege. Now don’t you find the discussion insightful? Especially, since we’ve received an out pour of responses, not only about the effects of R R & R on their performance even theories that support the views expressed and proof as well from people like Daniel Pink & Herzberg’s Motivation – Hygiene Theory. We’ve also received categorisations and the parameters to consider to reward a deserving Recruiter through R R & R. Moreover, we’ve even got some great tips and ideas to carry out our own R R & R programs to formulate based on our organisations requirements. All of the aspects mentioned above in its self are quite comprehensive and for sure portray the importance of having Recruiter Rewards & Recognitions (R R & R) supported with clear cut explanations to go with them. Therefore, we’re certain that you’ve realised what you’ve been missing out on. Hence, be sure to follow us @SourcingAdda to get real time updates to our upcoming events and activities. But before you go, make sure you leave us your views or requests to join our happening WhatsApp Groups in our comments section. There has been a gradual trend of buying businesses which makes it obvious to think of the impact such evolvements in the Recruitment Sphere will bring about. In an attempt to understand what the impact will be we’ve taken a scenario and have had a discussion on it. The discussion above is proof of the out pour of responses we’ve received and we can say that it was truly one heck of a discussion. How great is that? We’ve even got interesting tool to boost Sourcing such as Dice which is very good as it has a huge database and popularity and efinancial is great if you’re into domain based hiring. Moreover, IIM jobs is good for specialised positions but into H.R. Finance especially for management positions. Its database is less but the Talent quality is good and it won’t support small positions. Naukri has its monopoly currently and will continue to do so as every single individual looking for an opportunity visit’s Naukri first and then comes to other portals like Monster etc. Well this sums up everything that we found to be important and we can say that the discussion was worth our while as well as yours. If you’re not part of these discussions and would like to become a part of them then leave us a request to be added in to the WhatsApp groups in the comments section. And we’ll add you at the earliest else follow us @SourcingADDA and Tweet to us your request to be added into the WhatsApp groups and we’ll surely add you to them. You’ll also receive updates to our upcoming events and activities upon follow so be sure to follow us. Technology has definitely simplified our tasks and this holds true for most Talent Acquisitionists and Recruiters alike. The development of software and the ATS is proof enough of the simplicity of the tasks. Although most organisations have moved on to such tools for better productivity we often forget how the Talent Acquisition profession used to be like. The key take a ways have been segregated into these sections to ease the learning since we’ve covered a lot of aspects. Data was maintained manually in excel which was time consuming and often resulted in delayed progress reports. Recruitment is now done using job portals, internal ATS for the candidate and position information etc. Updated data on any platform is dependent on Candidates updating their records or resumes in real time. 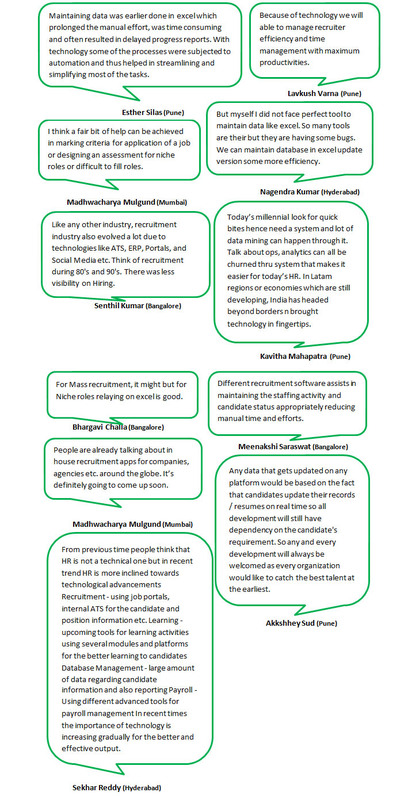 There are already in house recruitment apps for companies, agencies etc. developed around the globe and is sure to become the in thing in Recruitment. If you’ve enjoyed this then you’ve added to your knowledge and we’re sure you’d be quite eager to learn more. If yes, then you need to join our WhatsApp Groups because you have no idea what you’re missing out on by being a passive learner. Be sure to leave us your views or your requests to join WhatsApp Group in our comments section and ensure you follow us @SourcingAdda for real time updates to our upcoming events and activities.